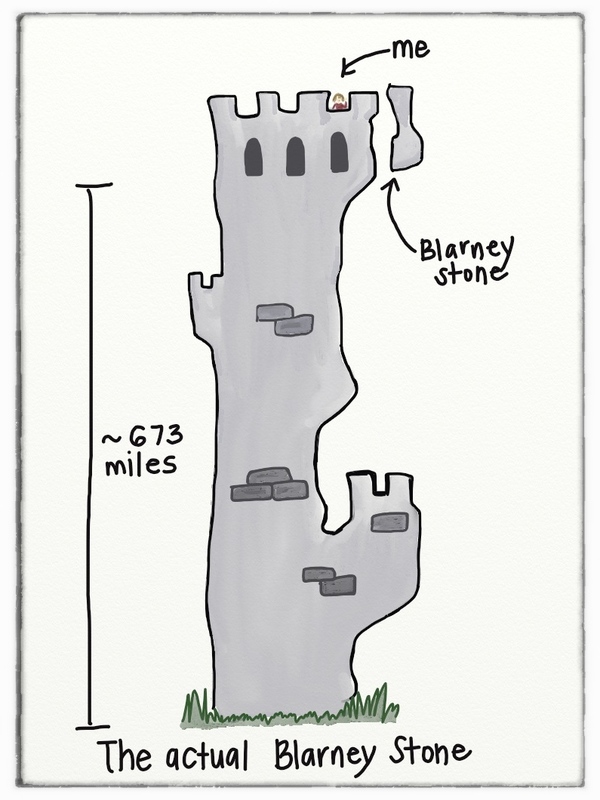 The Blarney Stone wasn’t at all what I expected. I think I expected to walk up to a benign, short and happy stone basking in a field, surrounded by clover and flowers and singing birds and Guinness. What I found was a castle in ruins with twisty narrow staircases leading ever up up UP to the famous stone. My parents and I made it to the top and were treated to a panoramic view of the outrageously green countryside. But where was the stone? Several uncertain laps around the top and I had my answer: it was – for all intents and purposes – hanging in mid-air from an outer wall. Across an expanse of empty air. Roughly 673 miles above the surface of the earth. I should perhaps mention at this point that I am not a fan of heights. Gravity and I have an uneasy truce, at best, and my total lack of coordination cheerfully feeds the fear that one day I’ll be standing on something tall, trip, and fling myself to pointless doom. It may take a village to raise a child, but it takes significantly fewer adults to sacrifice a young person to the capricious gods of gravity. I slowly approached the man overseeing this operation. He was roughly 734 years old and weighed maybe 90 pounds. He would be the one spotting me as I leaned over a gap of a couple of feet to grab metal bars on the outer battlements, bend backwards over a drop of several hundred feet to kiss a rock. Hear me when I say that in a lifetime filled with doing all manner of stupid things, this ranks near the top. For comfort, the man provided a wool blanket as a cushion. You know, against the smoothed-by-centuries-of-wind-and-rain rock. 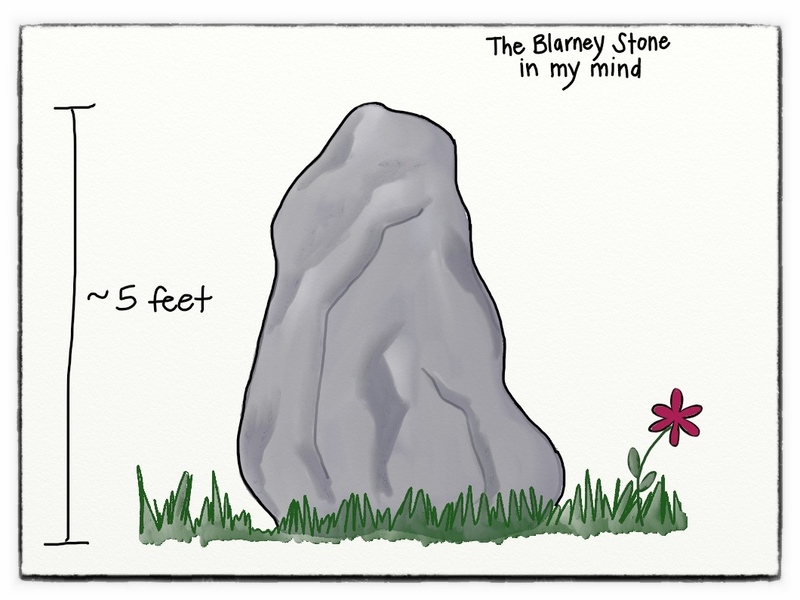 I fully expected to launch like a pebble from a slingshot and wondered, almost in passing, if they’d write “Death by Blarney Stone” on my grave. Clearly I made it, but trust me when I say it won’t ever happen again. I finished and everyone applauded and patted me on the back and then all of a sudden EVERYONE wanted to kiss it. People are so weird. I wandered over to a far battlement until my parents called me back and handed me the camera. Dad, who was a pretty big guy, went to sit on the blanket and in a moment of profound silence – like the universe itself was holding its breath – he let out the loudest fart I ever hope to hear for the rest of my time upon this earth. The silence continued, only then it was different. It was the sound of people recognizing something that transcends all language barriers. It was the sound of people meeting each others eyes in shock and then glancing away. It was the sound of barely suppressed laughter, building like a wave in the sea. “That oughta relieve the pressure a bit, sir,” said the little old man. The top of that tower EXPLODED with peals of laughter, people doubled over, tears running down their faces. Dad grinned, sat back down, leaned back and kissed the stone, followed by mom. People smiled as we left, waving. I stalked down the steps, furious. My father just farted on one of the national symbols of Ireland. Even worse, I heard him and mom behind me wondering aloud if they sold “I farted on the Blarney Stone” t-shirts in the gift shop. Would my humiliation know no boundaries? My parents were torn between comforting me and plotting a new clothing line. I decided to ignore them for the rest of my life. That night, over a quiet dinner in a local pub, dad looked at me and pouted out his lower lip. He was trying for remorse but spoiled it with a barely suppressed snort. I glared and then reluctantly gave a muffled giggle. Mom started chuckling. Dad’s laugh started deep in his belly and rose through his body until he was letting out a surreal snorking sound through his nose. We were laughing so hard at this point that other diners stopped and stared until, one by one, they joined in. We laughed, we chortled, we had tears rolling down our faces, we were holding our sides and gasping for air. “That oughta relieve the pressure a bit, sir!” Dad blurted out, and we were off again, howling in glee. 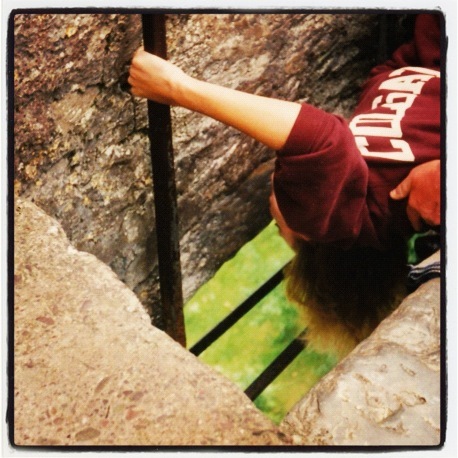 I’m pretty sure I had the gift of the gab long before kissing that stone, which makes my net gain from the entire episode residual embarrassment and an even greater fear of heights. My advice is this: if you go to Ireland (which you should, because it’s a glorious place), find a nice, convenient, relaxed-looking rock someplace safe (ie: on the ground NEAR Blarney Castle), kiss THAT, then continue your adventures. It’s far safer, much easier and the chances that someone farted on it are negligible, at best. There is such joy in your storytelling, Mickey. It wraps itself around a reader. Once again, I laughed out loud til my sides ached. Which I’ll take as a substitute for sit-ups today. Thank you! That was one of the funniest stories I ever read……nothing like a little chuckle…..however, I was laughing so hard I had to stop reading three times until I got my laughter under control….and am still laughing. I’ve been to Blarney Castle twice, climbed the treacherous pie-shaped stairs up and, of course, down, and did not kiss the Blarney Stone….but got some great photos. Thank you for the story……LOVED it! THAT was the same guy who was there when I kissed the stone. I was less freaked out by the acrobatics, than the 734 year old towel that was used to wipe kiss after kiss after kiss off of that stone. OMG, Mickey! You are so freaking funny! I love that you exaggerate like I do (734 years old??). 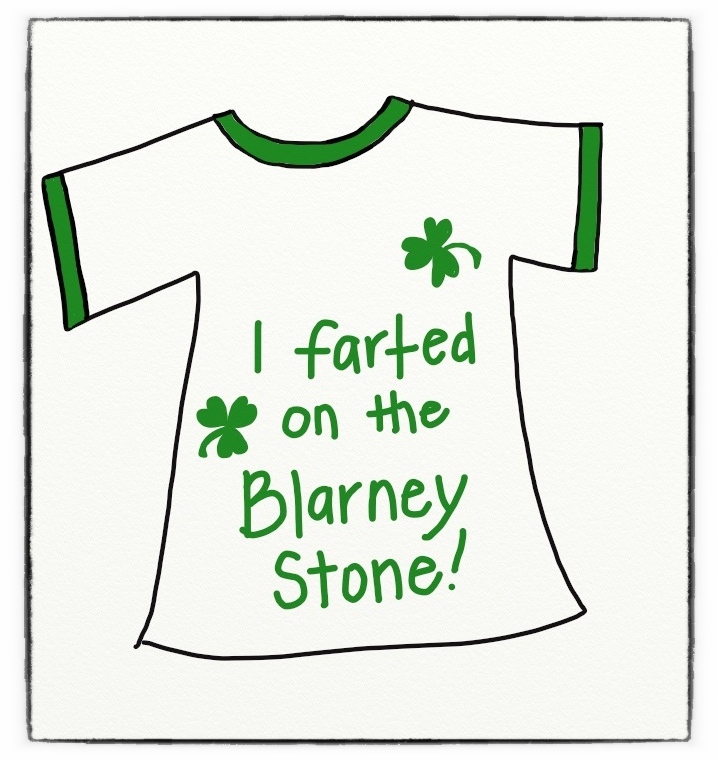 But the “I farted on the Blarney Stone” t-shirts and your drawings to match your story? Priceless. I’m having fun with the storytelling and illustrations – I think it’s because I have snapshots in my mind that I see when I narrate, and they easily translate into silly drawings. Glad you’re enjoying them, Gini! Now I HAVE to go to Ireland! So funny! A big thanks to Dave Bittner for sending me here. Can’t wait to read your other posts. Thanks for stopping by, Karen, and glad you enjoyed it (and yay, Dave, for sending you here!). I’m trying to blog more frequently, so hope you’ll check back in. And I’d definitely recommend travelling to Ireland – the people are fantastic and the country is simply gorgeous. Just be sure to watch out for heights and angry sheep. Brings back wonderful and funny memories. I remember hearing “I’m never talking to Dad again”. Well I’ve always been a little on the dramatic side (as you well know). In Rome it was, “I’m never getting into a car with dad for the rest of my life!” That one lasted all the way until I needed a ride to the airport, two days later. Ha, such a great story Mickey.